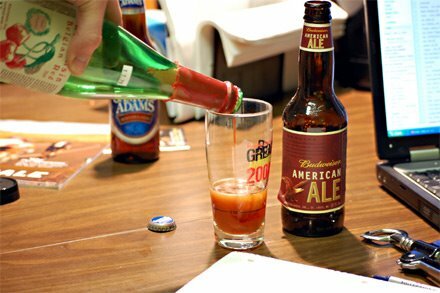 Hoosier Beer Geek: A Beer Blog for Indiana, from Indianapolis: Can Budweiser American Ale Be Saved? THIS WAS OUR APRIL FOOL'S JOKE. PLEASE DO NOT MIX BUD AMERICAN ALE INTO YOUR DARK LORD. Back around Christmas day, having run out of the beer we brought home with us, Gina and I stopped at the local gas station to pick up something to drink. 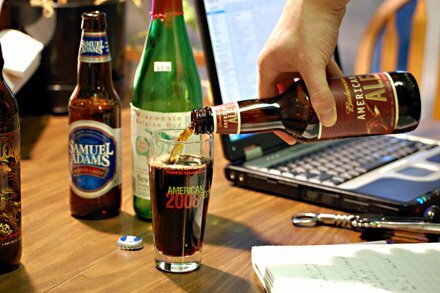 The options (at least the options we'd consider): Sam Adams Boston Lager, New Belgium Fat Tire, Budweiser American Ale. I figured it was time to give the Budweiser product a shot, so we bought a sixer. For a company that sells itself on "drinkability", I just couldn't believe how much I DIDN'T want another sip. It just wasn't agreeable in any way I would have expected. I'm tempted to write a post titled "Is Budweiser American Ale a subversive attempt to turn the general public off to all ales forever?" And really the only thing that stopped me was the thought that we'd be sued. In any case, I've rethought my opinion of Bud American Ale. After all, despite leaving my six pack in Illinois, no one in my family would touch the stuff. So I had six of them to make my way through. Revisiting the stuff today, I'm struck by a few things: a beer-poured-on-grilled-meat nose (not a bad thing), a weak hop presence, and the lingering one-note-ness of it all. Beer Advocate says this is a B-minus beer, but I'd go with a straight C. Perhaps I can fix it, though. After our experience with the American Ale back in Illinois, we ended up buying Sam Adams Boston Lager the next day. Here's a beer thats not big or bold, but still flavorful and balanced. It's a really great lager. 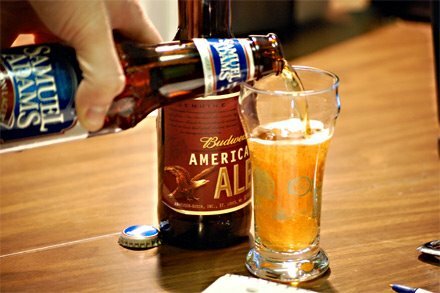 When added to the Budweiser American Ale, bigger caramel flavors come out, and the mixture makes for a balanced, yet somewhat weak beer. I suspect that most of the flavor is coming from the Sam Adams. But I was after something a little better. I'd say it's a B. This is getting more interesting. 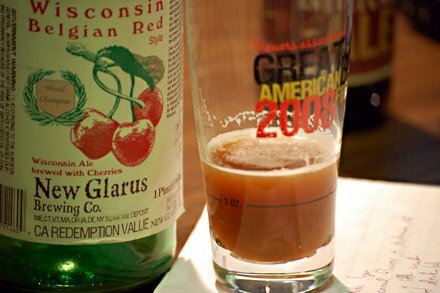 The reddish colors of the New Glarus beer make the American Ale cloudy, and lead to a beer that's weak on the front end. But the beer finishes with a sweet cherry kick. Interesting, but probably worse than the Bud Am Ale/Sam Adams combo. This is a C+ at best. When you're mixing anything with Dark Lord, the Dark Lord comes first. This mixture, while extremely dangerous, was also extremely rewarding. 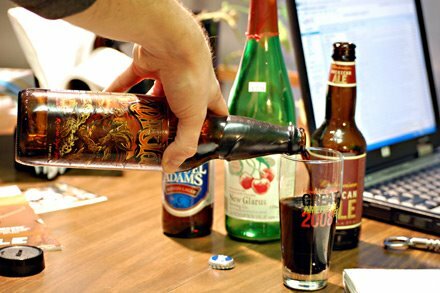 The mildness of the Bud American Ale mellowed the over-the-top sweetness of the Dark Lord, leaving an even smoother and more agreeable beer. No one would ever say that Dark Lord is balanced, but the addition of American Ale made the Dark Lord almost session-able. An amazing surprise - one I won't hesitate to recommend. A++. 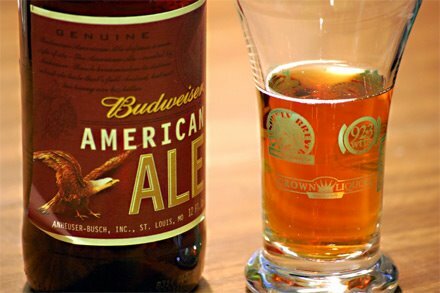 So can Budweiser American Ale be saved? Yes. Just add some Dark Lord. I think baby Jesus cried a little when you joined a New Glarus beer with Budweiser. At least it was done in the name of good journalism! Of course my one taste of Bud American Ale, which thankfully was a free sample at Fireside Brewhouse, ensures I will never have any laying around. Personally I prefer to leave beer out of mixology except in Germany. Where you can order beer with all kinds of sodas and lemonade in it with fun names like 'Diesel'... But that's a story for another day. Stay tuned, readers. For our next review, we're doing a PBR/Lost Abbey mixing free-for-all. Sick and wrong is all that I can add to this tale. Cable Car + PBR = Crazy Delicious!